The GOP is engaged in a much needed post mortem of the 2012 election and looking at the data to see how Romney and other Republicans lost ground in the House, Senate and the White House. I had my quick reactions the day after but now I’m ready to do more digging in the polling data so that I can do my part to refocus and make sure people are elected in the 2014 elections that believe in Conservative fiscal/economic policies and put the US back on the path to prosperity. 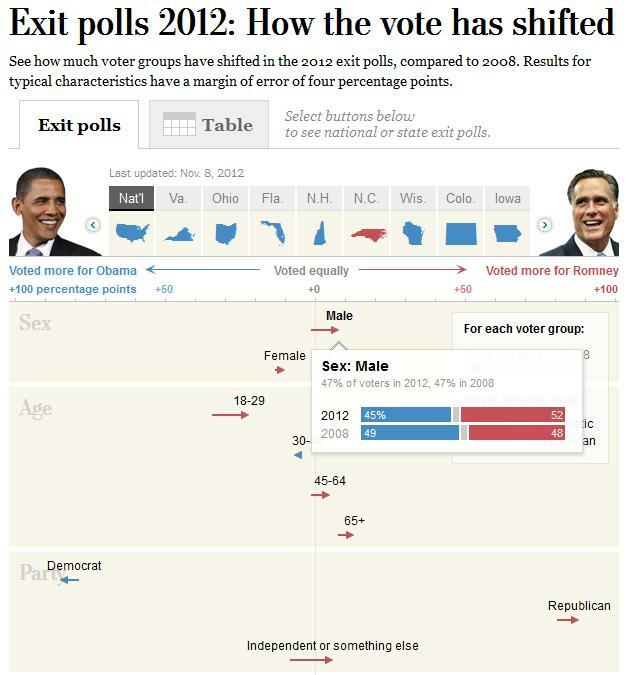 The Washington Post has a great site showing the 2012 Presidential exit poll data in a graphical format that is easy to view and I’ll use that data to make some observations. Note that the data is taken from national exit polls and there are specific state exit polling for North Carolina, Florida, Ohio, Virginia, New Hampshire, Wisconsin, Colorado and Iowa. 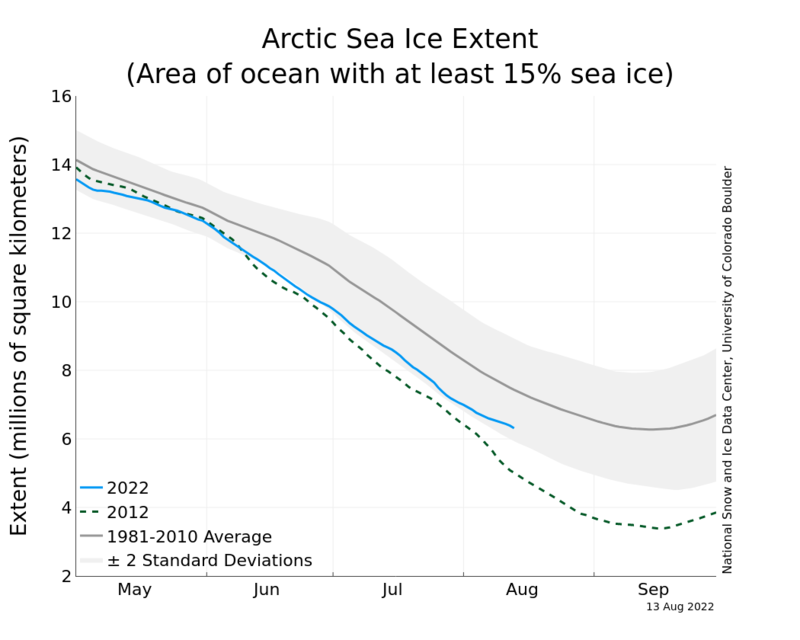 The data are displayed graphically using arrows with the direction showing the change in support percentages (in each demographic group) between Republican and Democratic candidates for the 2008 and 2012 elections. 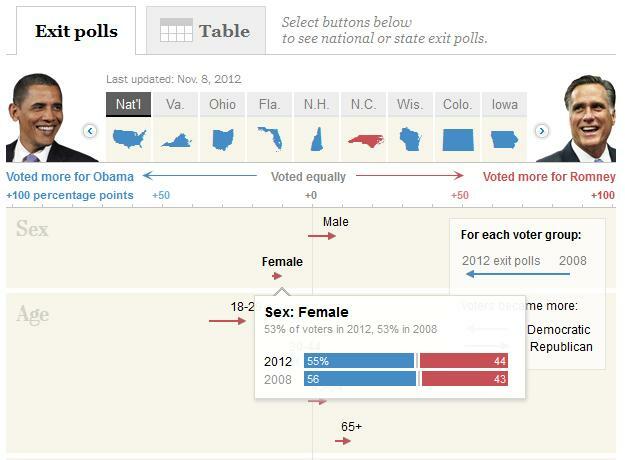 The data also show how the percent of the overall electorate each demographic group represented. For example, on the picture below, I hovered my mouse over the “Male” demographic to find that in both the 2008 and 2012 elections, men made up 47% of the overall electorate and Romney gained support with men 52% to 48% in 2012 vs. 2008. A quick scan of the data show that Romney, and the GOP, actually have some good news from this past election – In demographics that were comparable between 2012 and 2008 (top issues were only shown for 2012), Romney gained support in 31 of the 40 demographic groups. Romney even picked up 2 percentage points with Blacks and 1 percentage point with Liberals! Despite the faux War on Women meme touted by the Leftists, Romney picked up 1 percentage point with women from 2008. But with Women making up 53% of the electorate, Obama beat Romney in this demographic 55% to 44% and this shows that the GOP has to have a better message to the women in America. 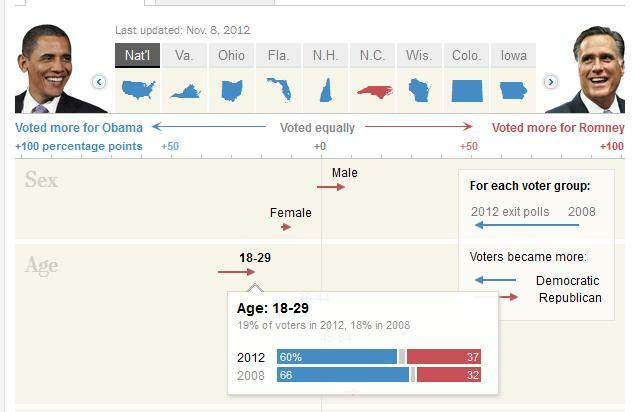 The youth vote also swung in Romney’s favor with the 18-29 demographic as Romney got 37% vs. 32% for McCain in 2008. But this demographic still went overwhelmingly in favor of Obama in 2012 50% to 37% for Romney and this group is now 19% of the electorate. 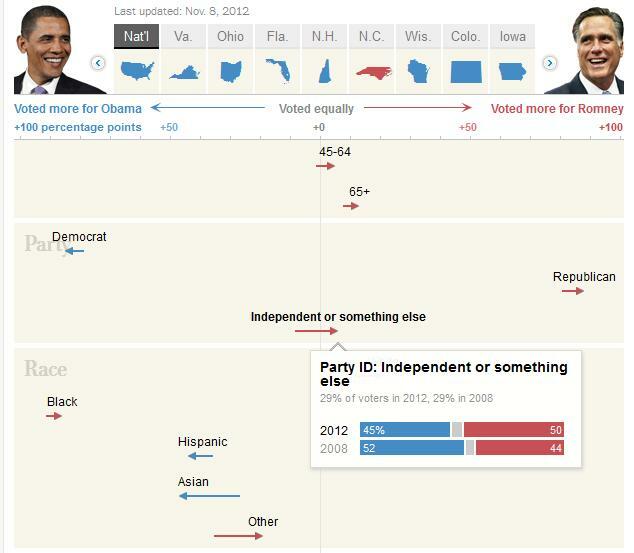 The biggest improvement Romney had over the 2008 election came with independent voters. Independents favored Obama over McCain 52% to 44% in 2008 but Romney actually won this group 50% to 45% in 2012! Then how did Romney lose with all these gains he made compared to the 2008 election? Blacks, Hispanics and Asians (who comprise 26% of the electorate) still favored Obama in such huge numbers that the small gains Romney made in the other demographic groups couldn’t overcome these powerful voting blocs. 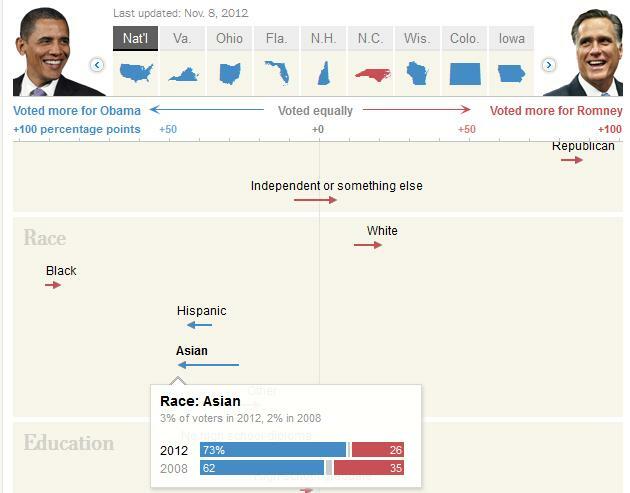 Blacks, Hispanics and Asians went for Obama over Romney 93% to 6%, 71% to 27% and 73% to 26% respectively. The voters who earn less than $50,000 per year make up 41% of the electorate and they also went for Obama in large numbers (60% to 38%) and this was unchanged from the 2008 election. Conservatives have to get their message to this group and explain to them that Conservative economic principles work for all Americans and not just the wealthy which is in contrast to what the Democratic talking points like to say. 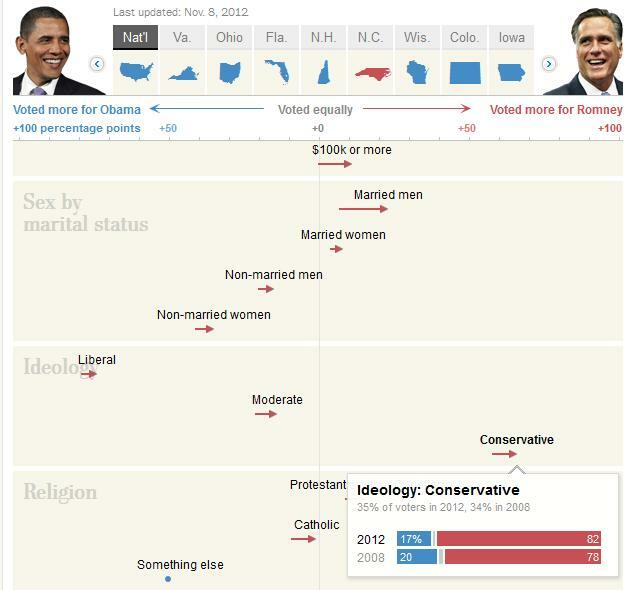 Those who consider themselves Conservatives went to Romney (no shocker) but they only favored Romney over Obama 82% to 17%. 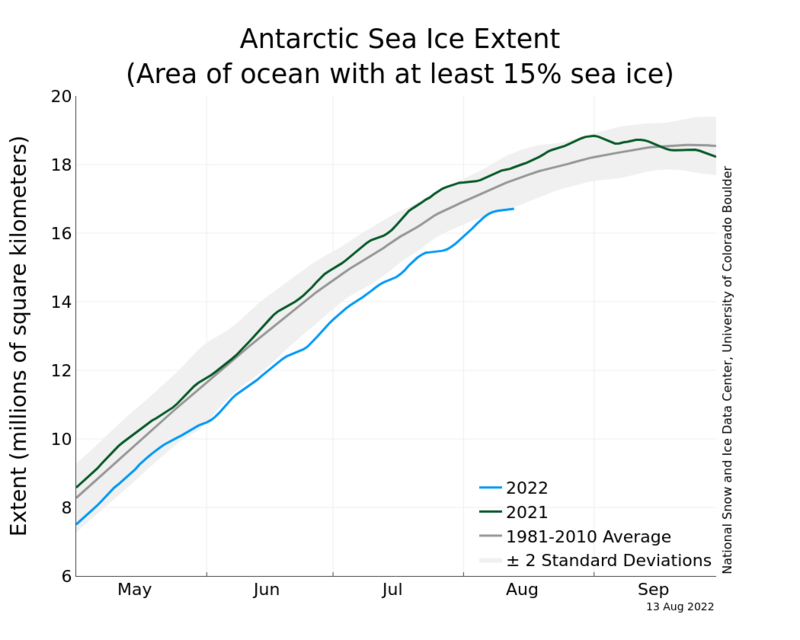 Why was this not higher? The Washington Post site didn’t have exit polling on Gay, Lesbian or Bisexual (GLB) demographic but Five Thirty Eight did have data on how this demographic voted in 2012 and these results also show an area where the GOP can improve. 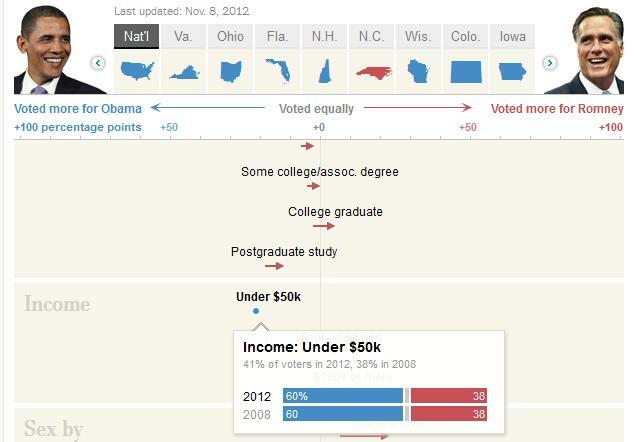 According to their data, GLB made up 5% of the electorate and they went for Obama over Romney 76% to 22%. According to this site, there were 124,691,305 votes cast in the 2012 presidential election and Obama won over Romney by just 3,694,622 votes. If 5% of the total electorate was comprised of GLB voters and 76% of them voted for Obama and 22% of them voted for Romney, that means 4,738,270 of GLB voted for Obama and 1,371,604 voted for Romney. The difference between the GLB votes for Obama over Romney amounted to 3,366,666 votes which is basically the margin of victory for Obama in the popular vote. The GOP made improvements in almost all demographic groups but the traditional Democratic voting blocs still favor Obama and that was the difference in the election. The GOP needs to address these weaknesses they have with Women, Minorities, Low income earners and GLB if they ever hope to win the White House again.